There are some endings that come with growing up, moving away for college, learning to support yourself and graduation. But nonetheless, the opening and closing of a new chapter is hard. I talk to my mentor in my sorority, Gamma Phi Beta, about what it’s like to face the next chapter in her life, graduation. Taryn Aab explains to Assignment: Radio's Hayley Thornton what it's like to be graduating and leaving Norman, Oklahoma behind. The sound of gathering sorority girls, something that perpetuates stereotypes, eliminates all hope of concentration, and requires some yelling to stop. But this sound is what many of us call home. This is the first day of “senior week” when we celebrate the seniors who are graduating. "Well we were told to put together a box of memories, pictures like that, for our senior in our G-phi family. So my little and I went to hobby lobby and we got a photo box, just memories from big/little, Soonerthon, different G-phi activities. And we also got a little rock that says together we are family. We just did it to show her how much we love her and appreciate her, and just you know, give her a nice end of the year gift." That’s Olivia, Hayley Thornton's “little” in her sorority family. Every fall, freshman members pick a sophomore member to be their mentor or their “big.” Hayley's is Taryn Aab, and she is graduating. "It’s really odd because this time 2 years ago, I was actually planning this event for the seniors, and now I’m here and I’m just kind of trying to take it all in," Aab said. "Today we are focusing on love so we get to spend time with our sorority families and I’m a really emotional person so there will probably be a few tears." 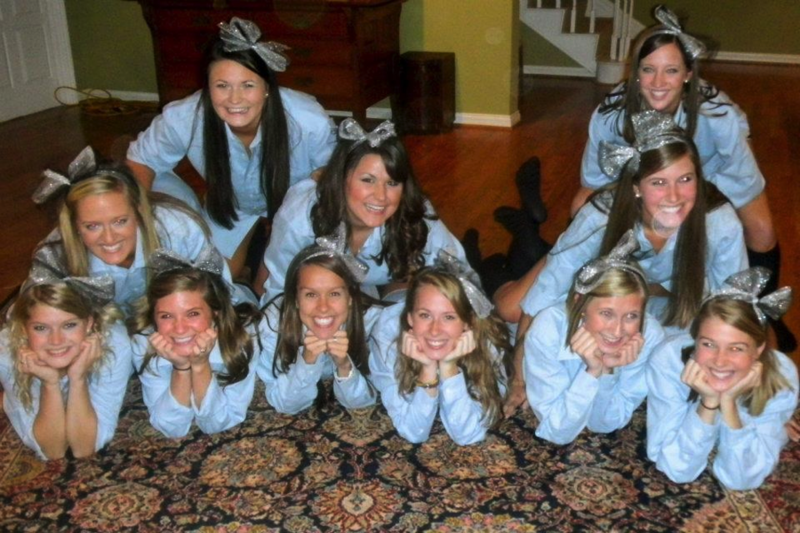 She opens her decorative blue and white box and picks up a picture of her sorority “family” from her sophomore year when she became Hayley's “big.” They are all wearing matching blue shirts, and are attempting a creative picture where they all stack on stop of each other; needless to say it looks a little awkward. She begins to open the card that everyone signed. Taryn is from Portland, Oregon and came to the University of Oklahoma to be closer to her fathers side of the family and immediately wanted to return to Oregon. The idea of joining a sorority didn’t appeal to her but reluctantly she joined Gamma Phi Beta, and with the support of her newfound friendships, she excelled. "When I initially came to OU I kind of put an expiration date on it, there was always an end in sight," Aab said. "But I created a home here, I joined several student organizations, got involved on campus, and through OU I studied abroad and I worked camp crimson and so it’s just a weird thought to think that I crammed so much into the last 4 years and now it’s just coming to an end." Hayley met Taryn the last night of sorority recruitment. Like Taryn, she had all but decided she was not meant to be a “sorority girl.” As she entered “Gamma Phi Beta”, better known as G-phi, she tripped in her 5 inch heels, sneezed on one of the girls at the front and spilt her bright yellow drink all over the white table cloth, and Taryn’s dress. To her surprise Taryn burst out laughing, took her hands and told her how much she liked her. Taryn’s warm demeanor, loving attitude and charisma single handedly changed her negative perception of sororities. "It is kind of discouraging when you hear the negative stereotypes about sororities," She said "because when they say it’s a sisterhood it really is a sisterhood, and these are bonds that are going to be unbreakable, and are ones that despite the amount of time that may elapse, or the distance between you and another person, its just one of those things that is unshakable and there’s nothing that will really bend it or break it, it’s kind of forever." These unshakable bonds help them get through the stress of class, ignore the drama, and learn how to laugh at themselves. And laugh at themselves they did. Each of them anonymously wrote their favorite memory of their last 4 years to be read at the end of senior night, and Taryn was included in a few of them. "I lived in my junior year and everyone convinced me that Taryn Aab had never kissed a boy, for a couple of weeks I was determined to get her a hook up, only to find out she’d kissed many." The laughng, crying and reminiscing continued. And many of the seniors expressed their fear of leaving. But Taryn says she’s ready. "I've definitely grown as a person, you know coming to college when you’re 18 you don’t really know who you are or who you want to be, and I’ve definitely experienced several ups and downs that I never thought I would," She said. "And through it I’ve feel I’ve become a stronger leader, and I’ve realized my weaknesses as well as my strengths and I’ve become more compassionate, and try to mold myself into somebody that others feel they can lean on, and It’s just really helped me grow up and become and adult that’s ready for life outside of college, life outside of undergraduate." Taryn Graduated yesterday with a Bachelors of Science in Multidisciplinary Studies with an emphasis on Non-Profit Organizational Studies and a double minor in Psychology and Medical Science. She is pursuing a Masters in Public Administration with an emphasis on Health Policy at Portland State University in Oregon. She hopes to be on the administrative side of the medical field.